Dwight Kemper is a man who wears many hats (including a fez! ), but make no mistake - he's a monster kid through and through. This week on Monster Kid Radio, Derek visits with this Rondo Award nominatated writer-performer-actor-and-many-other-hyphenates to talk about his background and history as a monster kid, what shaped his interests, and what he did with his mother's urn. Be sure to visit our complete website at http://www.monsterkidradio.net, and don't forget our Wiki Campaign! Double Feature Week continues on Monster Kid Radio with Scott Morris (Disney, Indiana and 1951 Down Place). The theme of the week is "Movies We Haven't Seen in a Long Time," and last episode, Scott picked 1951's When Worlds Collide (dir. Rudolph Maté). In this episode, they discuss Derek's pick - 1956's The Mole People (dir. Virgil W. Vogel). Also, Derek invites everyone along for the next Monster Kid Radio Crash happening 4/1 at the Joy Cinema in Tigard, Oregon. Be sure to visit our complete website at http://www.monsterkidradio.net, and don't forget our Wiki Campaign! Scott Morris (Disney, Indiana and 1951 Down Place) joins Derek on this week's episodes of Monster Kid Radio for Double Feature Week! What's the theme? "Movies We Haven't Seen in a Long Time." Scott picked 1951's When Worlds Collide (dir. Rudolph Maté) and Derek picked 1956's The Mole People (dir. Virgil W. Vogel). (As a bonus, the theme for this Double Feature Week could have also been "Movies the Other One Hasn't Seen Yet!") In this episode, Derek catches up with Scott before diving into When Worlds Collide. Also, Derek invites everyone along for the next Monster Kid Radio Crash happening 3/25 at the Joy Cinema in Tigard, Oregon. Be sure to visit our complete website at http://www.monsterkidradio.net, and don't forget our Wiki Campaign! Which luchador would Keith J. Rainville best compare to Batman? You'll find out in this episode of Monster Kid Radio when Keith and Derek talk about the Lucha Hero films of Mexico. It turns out Santo, Blue Demon, Mil Mascaras, and the rest, were all uniquely sorted to best fight the forces of evil! You should be ready to take notes because Keith is going to discuss a handful of movie titles that will get you started on your luchador journey. Be sure to visit our complete website at http://www.monsterkidradio.net, and don't forget our Wiki Campaign! Nicholas Hatcher (Vampire Over Hollywood: The Bela Lugosi Podcast) continues his visit to Monster Kid Radio and talks with Derek about the 1943 film Dead Men Walk (dir. Sam Newfield). This film features the winning combination of George Zucco, Dwight Frye, and . . . George Zucco again? (SPOILERS!) Also, Derek shares some news about an upcoming DVD release that he's itching to add to his collection. And finally, Paul McComas calls in to celebrate the life and accomplishments of Leonard Nimoy. Be sure to visit our complete website at http://www.monsterkidradio.net, and don't forget our Wiki Campaign! Nicholas Hatcher is the man behind the new podcast Vampire Over Hollywood: The Bela Lugosi Podcast, and Derek welcomes him to the podosphere by inviting him to Monster Kid Radio. How did Lugosi get his fangs into Nicholas? You'll just have to listen to find out! Also, Derek casts a Monster Kid Radio light on this year's nominees for the Rondo Hatton Classic Horror Awards. Be sure to visit our complete website at http://www.monsterkidradio.net, and don't forget our Wiki Campaign! What would YOU do with a time machine? The official ballot for this year's Rondo Hatton Classic Horror Awards has been released, and voting is now open! Many of the people who received nominations on this year's ballot have appeared on Monster Kid Radio over the years. What follows is a list of every nomination featuring a previous guest of Monster Kid Radio. 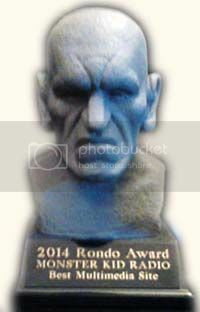 To vote in this year's Rondo Awards, simply email taraco@aol.com with your selections. You must include your real name in the email, and only one vote per person is accepted by them. You don't have to vote in every category. Go show these nominees - and all the other nominees in all the other categories - some Monster Kid Radio love! Monster Kid Radio crashed the Joy Cinema's Weird Wednesday showing of The Last Man on Earth (dir. Ubaldo Ragona, Sidney Salkow), and since Derek brought his portable recorder with him, you'll get to hear what happened at the show! A number of MKR friends came to the screening as well, so we'll hear from Rick Myers (The Recovering Ubergeek), Jeff Polier (Polier Graveyard), Jeff Dean, Rachel Cook, Bryan Cook (all three from the Kaijucast), and the Joy Cinema's own Jeff Martin. Be sure to visit our complete website at http://www.monsterkidradio.net, and don't forget our Wiki Campaign! In this episode of Monster Kid Radio, Derek and listeners of Monster Kid Radio reflect on what Leonard Nimoy meant to them. 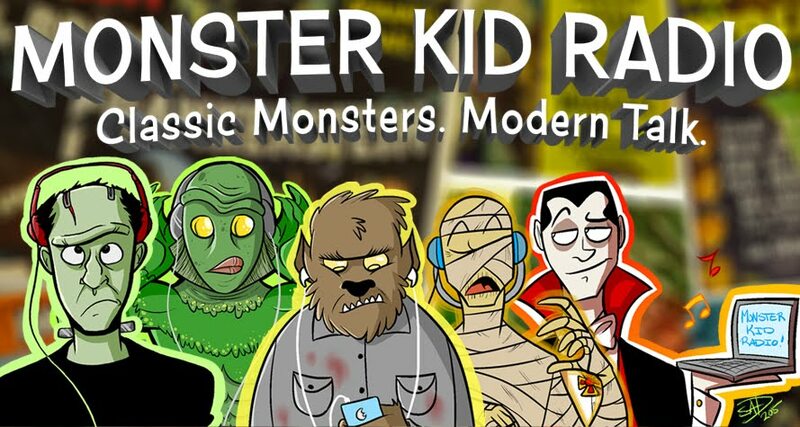 Be sure to visit our complete website at http://www.monsterkidradio.net.